The front-runner for Israel's election next week, Benjamin Netanyahu, said Wednesday that Israel's offensive against Hamas militants in Gaza last month did not go far enough. Netanyahu says the government stopped the operation before the military could halt Hamas arms smuggling through tunnels under the border with Egypt. He also called for removing Hamas from power. He told a security conference that the government "did not allow the military to plug the hole in the south." Netanyahu said the Hamas regime in Gaza is an extremist fanatic regime backed by the extremist fanatic government of Iran. Hamas forces overran Gaza in June 2007. "There is no choice but to uproot the Iranian-backed regime in Gaza," he said. He stopped short of saying that he would attack Gaza again to bring that about if he is elected. Meanwhile, critics of the offensive, including Palestinian President Mahmoud Abbas, accused Israel of committing war crimes during the three-week campaign and insisted Israeli leaders be held accountable. Polls show that Netanyahu's hawkish Likud Party and its hawkish allies would receive a majority in the new parliament after the Feb. 10 election, giving him the best chance to be named prime minister. Netanyahu warned that any territory Israel relinquishes will be "grabbed by extremists," referring to the possibility of trading West Bank land for peace in a deal with the Palestinians. Such an exchange is the cornerstone of current peace efforts backed by the U.S. and international community. A year of U.S.-backed negotiations between Israel and the Western-backed government of Palestinian President Mahmoud Abbas has produced no discernible progress. 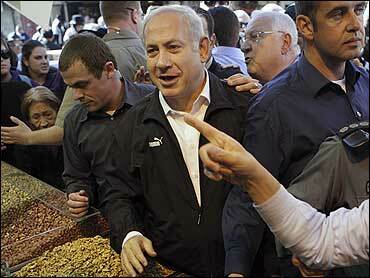 Netanyahu said negotiations with the Palestinians should concentrate on economic issues and policing. "That is not a replacement for political negotiations" toward a peace treaty, he said. "It is the only path toward them." Foreign Minister Tzipi Livni, who helped direct the Israeli assault on Gaza, is slightly behind Netanyahu in the polls. She advocates negotiating a peace treaty with Abbas but has called for stern measures against Hamas if rocket fire continues from Gaza. The other architect of the Gaza offensive, Defense Minister Ehud Barak, is far behind, with some polls showing his center-left Labor Party in fourth place.